O’Connor, Parsons, Lane & Noble are attorneys based out of Westfield, NJ that specialize in personal injury, medical malpractice, and employment law. 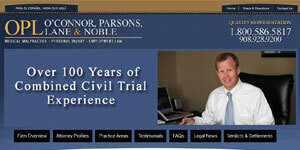 Our attorneys are experienced, and have won multi-million dollar settlements and verdicts on behalf of our clients. We take cases on a contingency fee basis, so we only get paid if and only if a case is successful.